Who doesn’t love a good giveaway? Our First ever Happy fall Ya’ll Giveaway is ending in just a few days but, the fun doesn’t stop there! 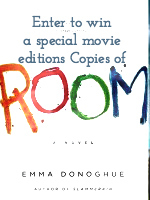 We are giving away three (3) Special Movie edition copies of “Room” by Emma Donoghue to get you excited about the upcoming movie release opening nationwide November 6th. And, don’t forget – the more entries you complete the more chances you have to win- just use the easy widget below and enter away. Make sure you share with all of your friends and family too! This giveaway is just oh-so-fab with an amazing prize. Yep, three lucky winner will win a special movie edition of the book. If you aren’t familiar with the storyline Emma Donoghue’s best-selling novel of 2010, is told by a young boy named Jack who spends his first five years locked in a small square room with his “Ma.” The young mother does what she can to make Jack’s life rich and full. When they finally escape from their confined surroundings, Jack is free to discover the outside world — a revelation to a child who has lived only within four walls. The book is lyrical, profoundly disturbing and a total page-turner, And now it has been made into a film of the same name. Both highly suspenseful and deeply emotional, this film is a unique and unexpectedly tender exploration of the boundless love between a mother and her child. After 5-year-old Jack and his Ma escape from the enclosed surroundings that Jack has known his entire life, the boy makes a thrilling discovery: the outside world. As he experiences all the joy, excitement, and fear that this new adventure brings, he holds tight to the one thing that matters most of all–his special bond with his loving and devoted Ma. To pick up a copy for yourself you can purchase them here. Please note: Giveaway ends November 4th at 11:59 PM EST. Open to Residents of the US only. Prizes cannot be shipped to PO Boxes. Winners will be selected by Random.org and be notified by email. Winners have 48 hours to respond before a new winner is selected. Please note that Adventures With Four is not responsible for sponsors that do not fulfill their prizes. I have represented each sponsor with the expectation they will fulfill their prize and in a timely manner. I will contact the sponsor regarding your prize(s). The sponsors, in most cases, are shipping their items to you directly. I will make every effort to assist you obtaining your prize. If there is an issue with a sponsor, please notify the blog you won a prize from within 30 days for assistance, after that we may be unable to assist you. The product provided for the review was free of charge from the company. The product offered for the giveaway is free of charge, no purchase necessary. My opinions are my own and were not influenced by any form of compensation. Facebook, Twitter and Google+ are in no way associated with this giveaway. By providing your information in this form, you are providing your information to me and me alone. I do not share or sell information and will use any information only for the purpose of contacting the winner. This one is new to me! I will have to check it out! I heard it’s a great book! I would love to read it! This would be my first Emma Donoghue book but it looks really good. The movie looks great, as well. This book series looks good. I am not the most avid reader but my mom would love this! I can’t wait to read this book! It just got delivered to my door and I am itching to crack it open! Seems like an intense book you just can’t put down! What a great giveaway! Thank you for sharing, this looks like a great gift! I can’t believe I haven’t heard of this before now. I simply must read the book and watch the movie, it sounds like a profound story I would not want to miss. This is on my to read list! This looks like a really interesting book and I’m very curious about it. Wow, I hadn’t even heard of the movie before. Looks very emotional. I’m sure the book is fantastic. There really is a boundless love between a mother and her child. I am sure it does tug at the emotions to watch this film! Count me in on this giveaway – I just read a review of the movie “Room” in People magazine tonight. This one is going on my reading list! Sounds fantastic! I actually just bought this book the other day. I can’t wait to read it. I did not know it was a movie as well! My sister loves reading stories like this. I will have to enter the giveaway for her. Emma Donoghue is a new author to me. I’d love to win. My favorite book is the The Woman Who Gave Birth to Rabbits! Ooh, the trailer gave me chills! I Loved that book. And it was terrifying. The mother looks just like I pictured her when I read it. Great giveaway! I think I’m going to throw this on my list of books to read — sounds fascinating! And the movie trailer looks great as well! This book looks so good! I have been looking for a new read, and it looks like I just found it! What a great giveaway! Wow this sounds like a tear jerker! Totally different than a lot of books coming out these days. I would love to read this! 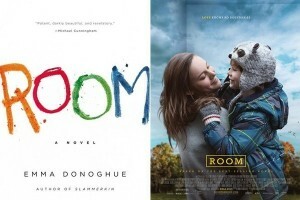 I had not heard of Room before but it sounds like it would be an interesting read. Were the boy and his mother being held hostage or were they confined by the mother’s choice? Wow definitely sounds intriguing! I could not imagine what this child experienced! That sounds really interesting a concept for a film – I wonder if it’ll remain true to the book? I can let you know once I get my copy of the book! I normally read them before I go and see the movie so I will let you know. That sounds like a great read. I would love to win a copy!